Leonides ill-gotten victory Wreath left few with an appetite to celebrate this outsider’s honor. However, those attending the Olympiad’s victory banquet that evening witnessed the most unforgettable faceoff of the Games. Leonides had the victor’s dais virtually to himself and his ego. Olympic dignitaries obligated to participate scattered around tables with other, less controversial, ribbon winners. The Champion was left to dine with damsels draped upon the seats like garnish, along with a motley handful of attendants, toadies and hangers on who would sit with demons provided the food and drink flowed freely. Nevertheless, they proved a fitting collection of ears to absorb the lion’s stream of prattle and boasts. With few to converse with, his belly and swagger both soon reached the tipping point. Phoebus decided now was the perfect time to stop by and engage in the Game’s final event. “LIAR!” roared Leonides. 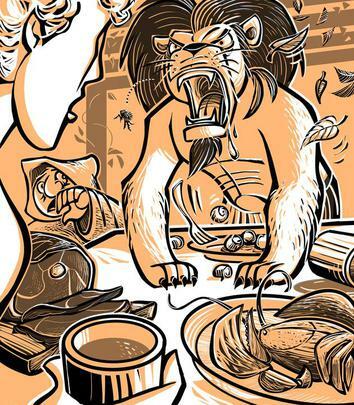 “Enough of this confounded charade!” He sprang from his seat, like the lion he was, snarling and gnashing his fangs. Larger than life now, the beast pounded the table with forepaws clenched and drooling for blood.